OK, I admit it–I’m cheating just a little with this week’s choice for Song of the Week. Yes, the Carter Family had first recorded this song for the Victor Talking Machine Company in 1930; however the recording below, by the late great Lonnie Donegan, falls well outside our default timeline of 1870 to 1939. It’s this week’s featured recording simply because I’ve been fortunate enough to find this 45 rpm vinyl EP on Ebay. The song passed into the repertoire of, among others, Woody Guthrie, Ramblin’ Jack Elliott, Cisco Houston, and Pete Seeger, becoming a staple of the mid-century American folk cannon. It was recorded by Lonnie Donegan in 1956. Donegan had been playing banjo with the Chris Barber trad jazz band, later the Ken Colyer band, since the late 1940s, but it was always American folk blues that had been closest to his heart. 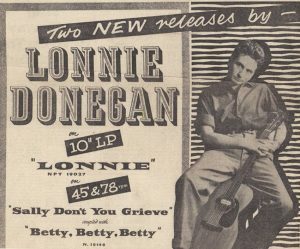 In fact, Tony Donegan became ‘Lonnie’ Donegan after opening for the American blues singer-musician Lonnie Johnson at the Royal Festival Hall in June 1952. Lonnie Donegan’s greatest heroes were Leadbelly and Woody Guthrie. By later 1954 he had left the Chris Barber band, and was forging his new role as the ‘King of Skiffle’, photos of him in those early years–the dress, the pose–clearly showing the debt to Guthrie. ⟵Song of the Week: Vesta Victoria, Now I Have To Call Him Father!